NEW YORK (CNN) -- John and Elizabeth Calvert enjoyed the good life on Hilton Head Island in South Carolina, friends said, but they were growing more and more suspicious of the way their business books were being handled. Things weren't adding up. Money appeared to be missing. 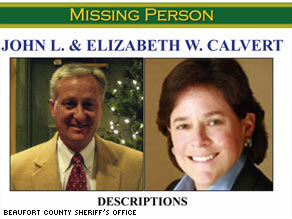 John and Elizabeth Calvert are featured on missing persons posters on Hilton Head Island, South Carolina. So they scheduled a meeting with accountant Dennis Ray Gerwing to address their concerns, recalled one close friend, Nancy Cappelmann. The Calverts said they were meeting with Gerwing at his offices in the upscale resort community at 6 p.m. last March 3, she added. It would be the last time anyone would see or hear from the couple. The Calverts lived part-time on their yacht, docked at the island's Harbor Town Yacht Basin, the same marina where they managed boat slips. They spent the rest of the year in Savannah, Georgia, and also had a home in Atlanta. Family and friends called police and reported the Calverts missing on March 4, after they missed appointments and still couldn't be reached. "I was supposed to meet John that night and he is never late, so when 20 minutes went by, I got worried and called his cell, but it went straight to voicemail, like it was turned off," Cappelmann said. She was a good friend of the couple's and worked at one of their harbor businesses. Police and search teams scoured the island. Divers and dogs searched the harbor and found nothing. The Calverts' small airplane was still at the island's airport and provided no clues. Their 2006 Mercedes Benz was found parked at a hotel in Palmetto Dunes, a gated community six miles from where the Calverts' yacht was docked. The Mercedes also contained no forensic clues. In reconstructing the Calverts' last days, investigators concluded that Gerwing was worth a deeper look. They now say they believe the 54-year-old accountant was the last person to see the Calverts alive. Gerwing ran the management company that kept the books on the Calverts' four businesses on Hilton Head Island. Authorities were already looking into possible financial improprieties involving the company, The Club Group. They named Gerwing as a person of interest in the case about a week after the couple disappeared. An internal audit later revealed that Gerwing had embezzled $2.1 million from the Calverts and others, police said. Gerwing committed suicide within hours of learning he was a person of interest, slashing his neck and legs with a steak knife, authorities said. He also left behind suicide notes with vague references to the Calvert case, said Beaufort County Sheriff P.J. Tanner. Tanner said the notes indicated some acknowledgement of responsibility for his actions, but didn't say specifically what those actions might have been. Police also gathered circumstantial evidence that seemed to point to Gerwing, including drop cloths large enough to use to wrap bodies and latex gloves purchased on the day the Calverts disappeared. In addition, police learned that Gerwing's cell phone had been turned off for 12 hours after he was scheduled to meet with the Calverts. If Gerwing were alive, Tanner said, police wouldn't have enough corroborating evidence to name him a suspect and arrest him. Police executed search warrants on Gerwing's office, home and vehicles and found soil in Gerwing's kitchen. Investigators hope analysis of the dirt might provide clues to the origin of the dirt and a new location to continue searching for John and Elizabeth Calvert. Friends and family are offering a $65,000 reward for information leading to the arrest of the person or persons responsible for the Calverts' disappearance. Police urge anyone with information about John and Elizabeth Calvert to call the tip line at (843) 524-2777. Police also are seeking help from anyone who saw the Calverts' 2006 Mercedes Benz E320, Georgia Tech license plate GT821B on or about March 3, 2008.